It looks too pretty to eat right? It did take me a day to cut it, but after that it was fair game! 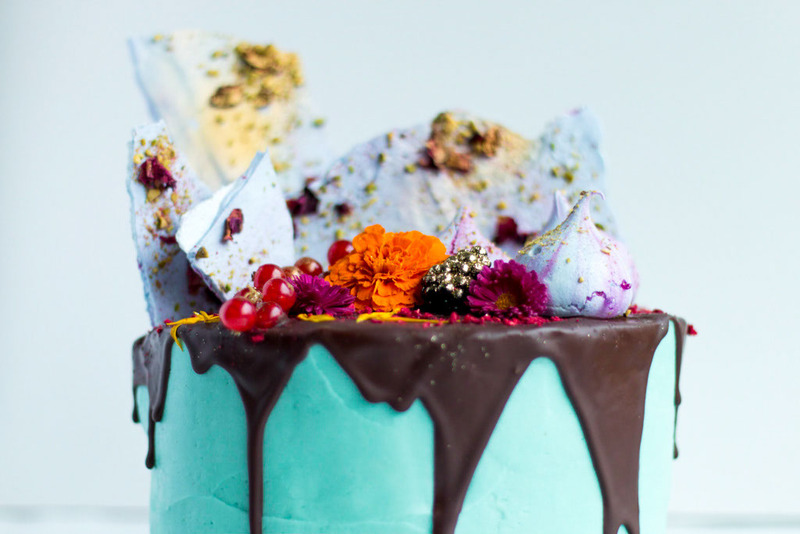 I love creative, organic looking cakes. 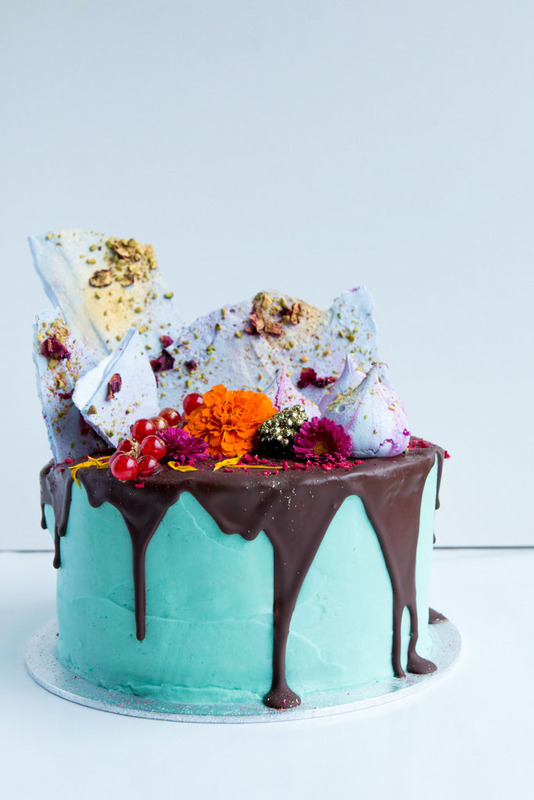 One of my all time favourite Instagram accounts is TheCakerNZ for her original cakes dripping in fruit, flowers and all things nice. Another style I had my eye on was that of Fondant Fox and Meringue Girls. 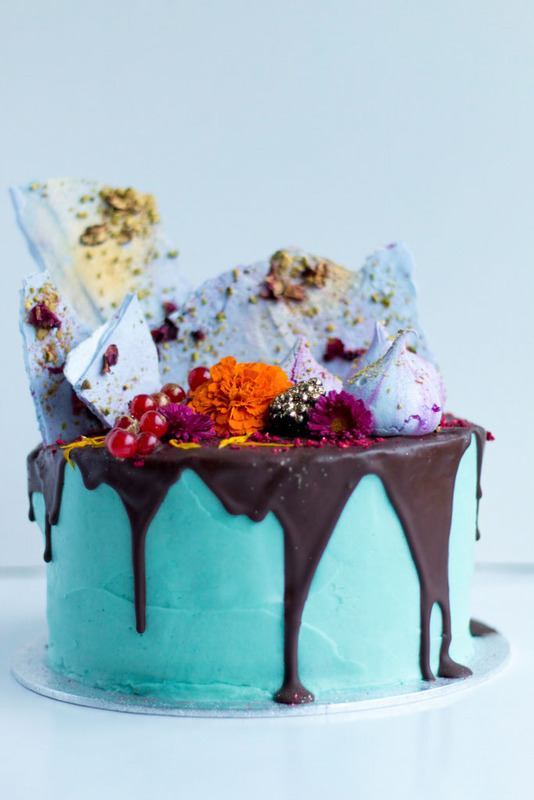 Their baking collaborations have filled my Instagram feed for months with colourful cakes exploding with out of this world decorations. 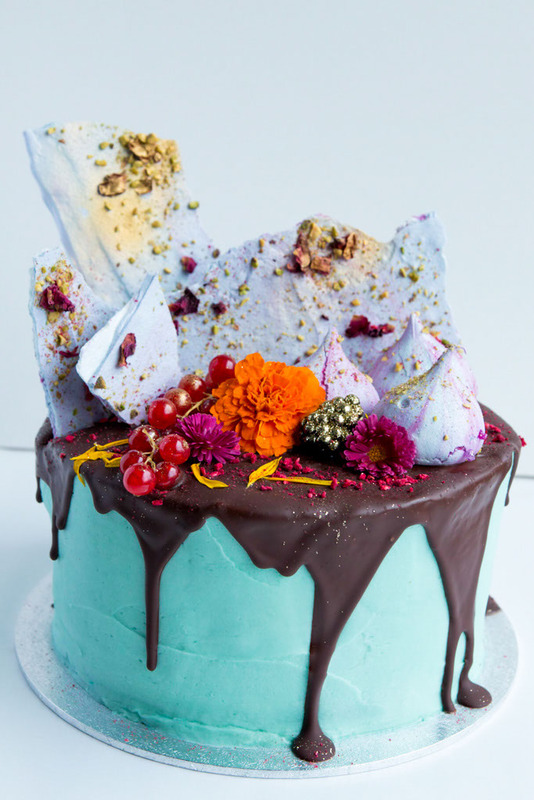 So when I came across the Electro Floral Cake Masterclass with Fondant Fox I mentioned to Ben that it would make a great birthday present.. nudge, nudge! I think he must have wanted to have a slice of this cake too, as he took care of all the details and booked me in for my birthday. Yay! 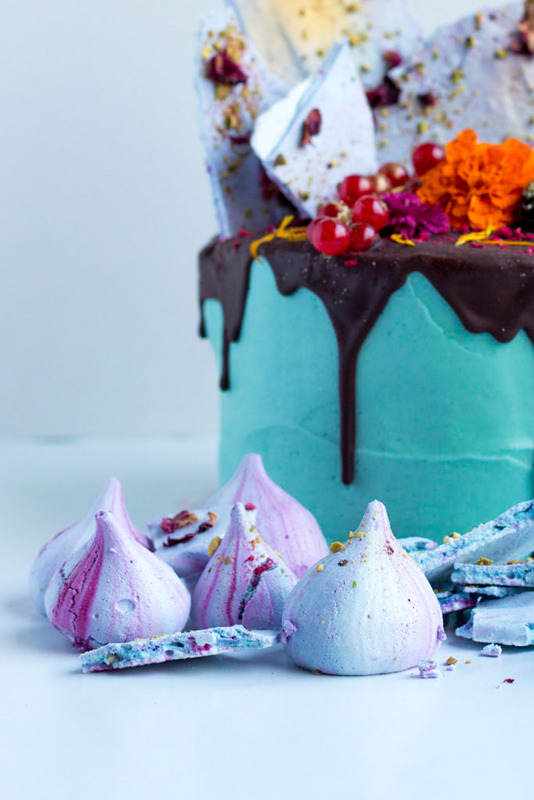 I dodged all the cyclists and tried to avoid all the dangerously cute indie bookstores on Broadway Market to arrive at the Meringue Girls HQ to get ready for my lesson in cake. I was joined by seven other awesome baking ladies, most of whom I’m now following on Instagram. You ladies rock! 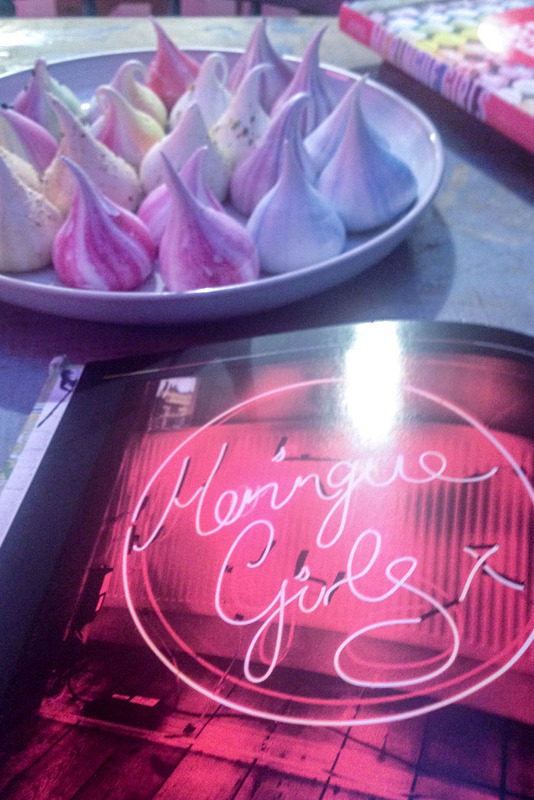 The first step was meringue. Fondant Fox took us through the techniques used by the meringue girls to get their ubiquitous coloured and flavoured delights. I especially love the rainbow coloured ‘Unicorn Poo’. Mine didn’t look nearly so professional but I loved the rainbow pink colour. I chose to flavour my meringue with rose-water, a flavour I have been obsessed with ever since my Rose macaron in Paris. 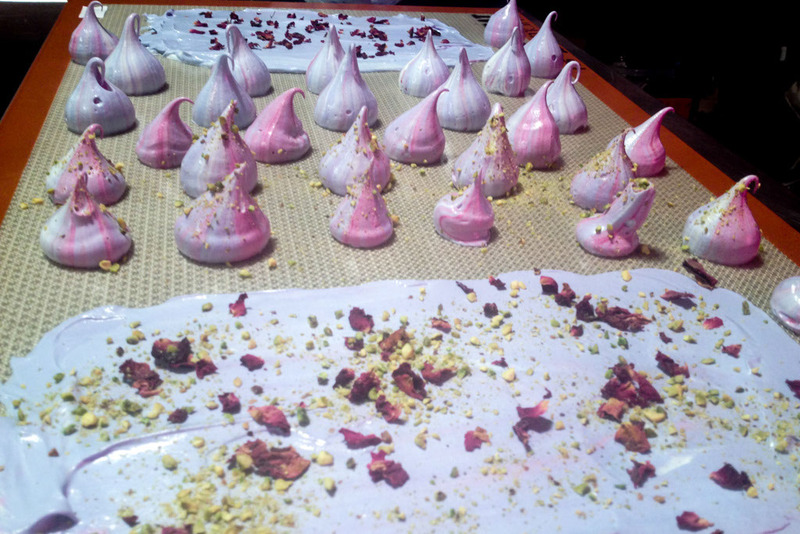 I coated my meringue shard with pistachio and dried rose petals then they were whisked into the oven for baking. We then set our attention to preparing the pre made vanilla cakes. 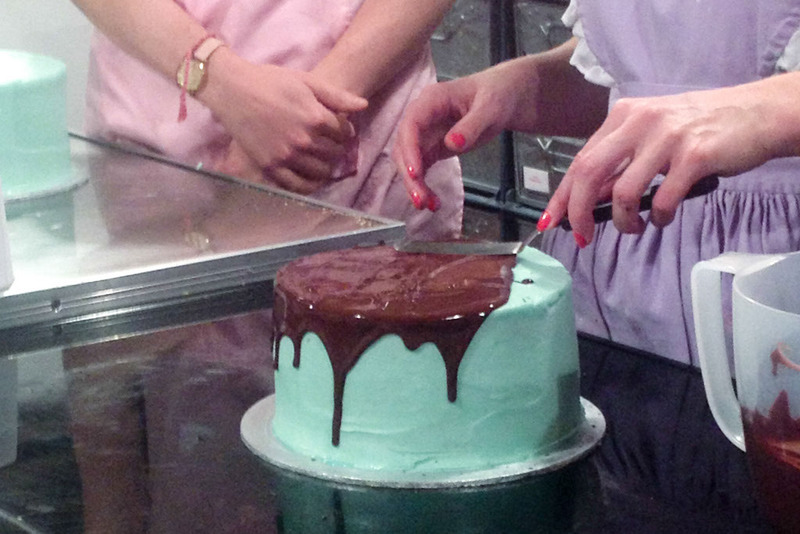 We cut four even layers from two cakes and started with a crumb coat of the mint coloured fondant icing. I was so lucky with all the flavour and colour choices made for this class as they were probably ones I would have chosen for myself. 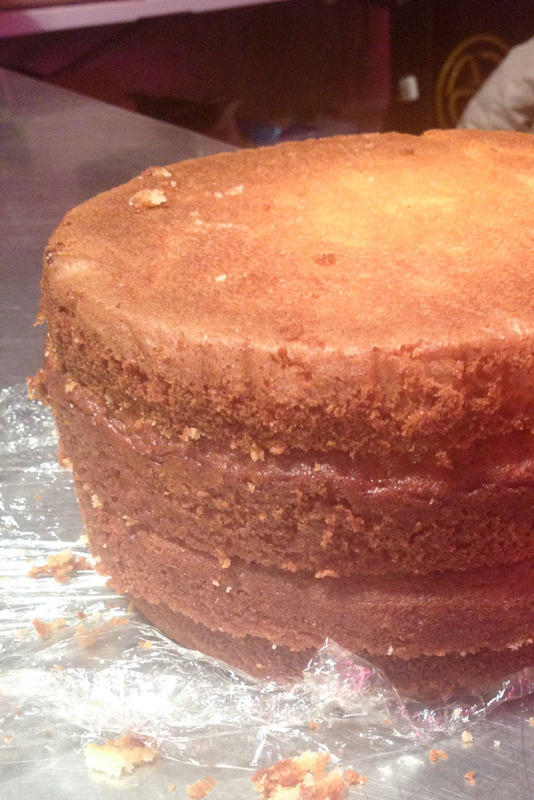 The fluffy icing was soon surrounded the cake and we were on to chocolate. This was the surprise of the night as the drip effect is made simply by slowly spreading a modest amount of melted high quality cooking chocolate over the top of the cake and just nudging it to the edge. 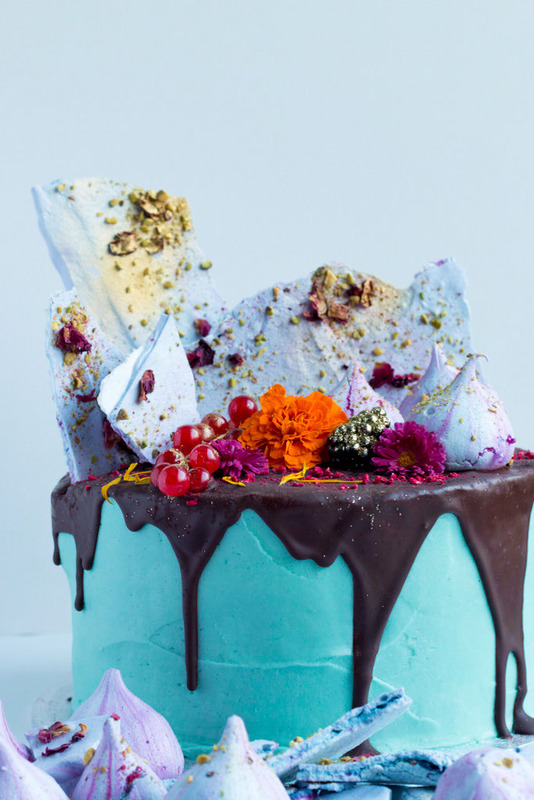 This means it slowly runs over the cake without splattering and you get the luxurious oozing drip effect. With half an hour to go in the class it was decorating time! 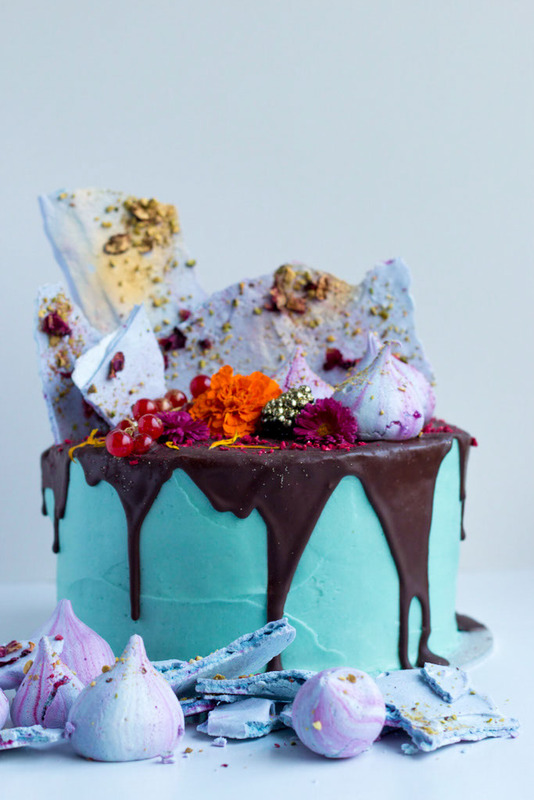 We smashed our meringue shards, coated berries in disco gold, and covered our cakes until heaving, with meringues and flowers. 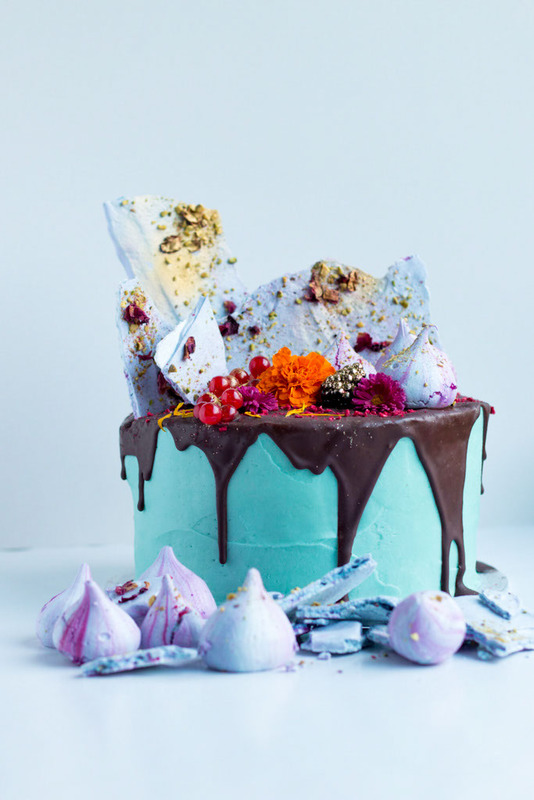 If that wasn’t enough we finished off with sprinkles of flower petals and dried raspberries, crushed meringues and lots more glitter. There was so much going on these cakes we had to make DIY extensions to cake boxes to fit them in. I was so nervous carrying mine home on the train, but I did manage to get it home in one piece. Phew! I had friends over the next night to help me eat it. At first we cut off modest slithers each and devoured them slowly savouring all the different textures and flavours. As we finished we looked at each other and knowingly said.. one more? It was too good for just one slice. My housemates and I spent the rest of the week eating it and munching on the extra meringues. It was a great dessert to look forward to in the evenings. I know some of the ladies in the class were using theirs as birthday cakes and gifts for other occasions but there was something extremely indulgent about having this whole cake to myself which I enjoyed a lot. This cake was so photogenic.. I took about 50 pictures of it before I cut it! Thank you Fondant Fox for a great class and thank you Ben for a memorable and delicious birthday present. This entry was posted in Growing Up and tagged Electro Floral Cake, Fondant Fox, London cake decorating class, Meringue Girls by andieinspired. Bookmark the permalink.